The central nervous system (CNS) of the third instar larva is a tissue of choice for studying conventional mitotic cycles in Drosophila. For example, squash preparations of the larval CNS are routinely used to investigate chromosome structural and numerical anomalies in late larval lethal mutants (e.g., refs. 1,2; also see Chapters 16-18), to study heterochromatin (e.g., refs. 3-5), and to localize chromosomal proteins by immunostaining (see Chapter 19). Mitotic chromosomes are not unduly harmed upon squashing, and for many experimental purposes it is advantageous to have them flat and well spread. However, the same cannot be said of the mitotic spindle, which is distorted or destroyed in squash preparations. A simple method for live analysis of mitosis in larval brain cells involves "pulverizing" dissected brain tissue with fine scalpel blades to produce a monolayer of cells for short-term (approx 1 h) study (6). The method can be used to visualize any mitotic proteins/structures for which green fluorescent protein (GFP)-expressing strains are available, and both wild type and mutants can be studied with equal facility. However, a potential drawback is that both the mechanical disrupting of tissue and nonphysiological culture medium used could have adverse effects on mitosis. Moreover, information about relative spindle geometry in a developmental context (e.g., ref. 7) is lost. A complementary approach to the above methods is to use whole-mount preparations of fixed brains to obtain a three-dimensional (albeit static) view of mitosis. This chapter describes a protocol for immunostaining whole-mount larval brains for analysis by laser scanning confocal microscopy. Fig. 1. Drawings of the larval CNS, viewed dorsally and laterally. The supra-esophageal ganglia at the anterior (top of figure) are fused to the ventral CNS. The dotted line shown in one ganglion delimits the region of the optic lobe anlagen (OL) where extensive cell proliferation occurs (6,8,9). 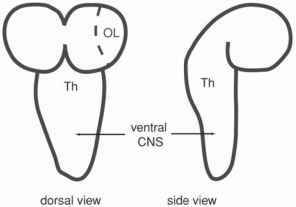 The thoracic neuromere region is indicated (Th). A detailed illustration of a larval brain can be found in ref. 10.
wedge-shaped protuberance, the ventral CNS (see Fig. 1). The supraesophageal ganglia will metamorphose into the brain and optic lobes of the adult head (reviewed in ref. 8). The ventral CNS is organized into a series of fused ganglia called neuromeres, with each neuromere corresponding to a different anatomical segment of the fly. A bulge in the ventral CNS (i.e., the thick end of the "wedge") corresponds mainly to the three thoracic neuromeres, where extensive ongoing cell proliferation begins soon after hatching (9,11). Concentrated there and in the optic regions of the CNS are numerous neuronal stem cells, or neuroblasts, that divide continuously throughout most of larval development (11) but do not appear to be required for larval function. Thoracic neuroblasts are relatively large cells that divide asymmetrically approximately every 55 min (at 25 °C) to produce another neuroblast and a smaller ganglion mother cell (GMC) (9). The GMC divides in turn, symmetrically, to produce two smaller postmitotic ganglion cells that will differentiate into adult neurons (9). 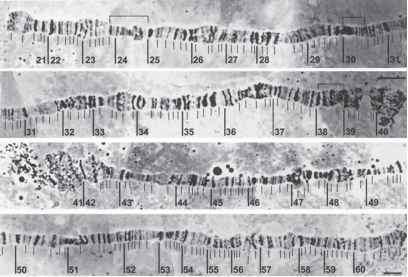 Mitosis occupies about one-fourth of the neuroblast division cycle in wild type (approx 15 min at 24°C; for details, see ref. 6). The superficial location of large numbers of actively dividing neuroblasts at the periphery of the CNS is a tremendous experimental advantage for imaging in three dimensions. Consequently, the optic lobes and the thoracic neuromeres of the ventral CNS are especially good regions to view mitotic cells (see Note 1). The protocol described here was adapted from a method devised by Audibert et al. (12) for preserving and visualizing mitotic spindles in imaginal discs. Its most important elements are the dissection and fixation conditions. Dissection should be done quickly so that the larval brain (or whole "head") can be immersed in fixative without delay. The fixative solution differs from some others commonly used in that it contains both a high concentration of formaldehyde (10% [w/v] rather than 3.7%) and the chelating agent EGTA [ethylene glycol bis(P-aminoethyl ether) tetraacetic acid)]. EGTA helps to stabilize spindles by sopping up calcium ions, which promote microtubule disassembly (e.g., ref. 13).